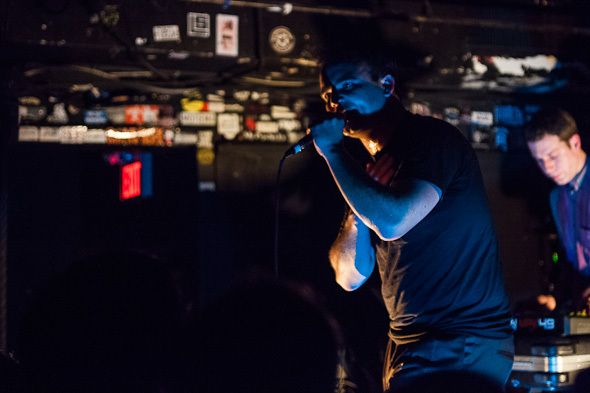 Baltimore's Future Islands arrived in Toronto for a sold-out gig at the Horseshoe Tavern last Thursday. While the band has been honing their synth-based sound for almost six years now, their fanbase has been rapidly expanding with each subsequently release, and the exuberant crowd gathered on the rainy night was proof of this. This is for good reason - both 2010's sophomore effort, In Evening Air, and 2011's follow-up, On the Water, are masterworks of a certain pop sound that at first listen may appear relatively conventional but with time reveal themselves to indeed wear their influences on their sleeves while simultaneously transcending any sort of labels or trends. Their sound on record is at once understated and anthemic; Samuel T. Herring's guttural screams and croons attempt to rise above warbly electronics and crashing, heavily compressed drum machines to create dance-ready pop songs that wouldn't have sounded out of place had Devo decided to focus on writing harrowing ballads following the release of Are We Not Men? Live, however, the band is a completely different story. Herring bounds around the stage like a madman, untied to any instruments as he frantically hollers the lyrics without sacrificing his staggering Dr. Jekyll and Mr. Hyde vocal range. If one was pressed to give reference points for his vocal styling, it would probably land somewhere between Morrissey and Gene Ween, with just a little bit of the intensity of Henry Rollins when he really begins to growl. However, he fluctuates his enunciation and tone wildly, rarely keeping within the same range in a single line, let alone for the duration of an entire song. 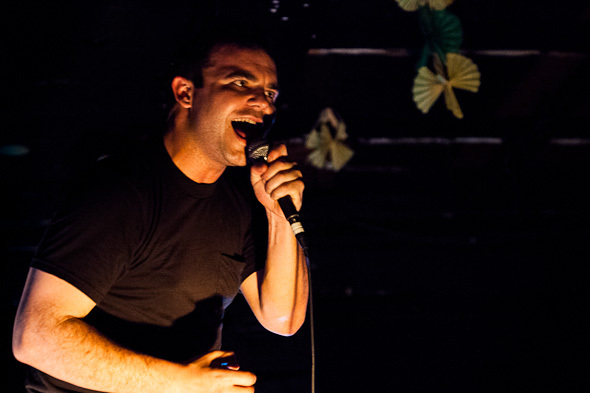 While these may sound like disparate comparisons, they are as close to accurate as one can get for the singularity of what Herring, and indeed, the rest of Future Islands bring to the table. The other two band members, bassist William Cashion and keyboardist/synth player Gerrit Welmers, are clearly aware that they need to do little else than remain stationary and mostly expressionless as they create the band's dense sound from surprisingly few resources. Herring plays the erratic yet passionate showman, and he does a damn fine job of it. Presenting a smattering of tunes from throughout their catalog, the set understandably centred around newer tracks from On the Water. Having previewed a few of the songs in advance of the album's release last June in support of Okkervil River and Titus Andronicus at the cavernous Phoenix, the audience had had ample time to get to know and learn every word to slow-burners such as "Give Us the Wind" and faster paced cuts like the foreboding yet funky "Before the Bridge." While Cashion and Welmers expressed little enthusiasm, Herring made up for their lack of stage presence and crowd appreciation in spades as he repeatedly thanked the capacity crowd for coming out to support them and for "singing along on some songs that really cut me up." Any thought that Herring's rapidly pitch-altering, heavily histrionic vocals veered into the realm of irony was proven incorrect upon taking in his onstage demeanor. In between bouts of taking his soft wail to a gravelly scream, he would beat his fist against his heart as if to lay bare the authenticity through physicality of his words. It was on In Evening Air highlights such as the climactic "Long Flight" or earworm "Walking Through that Door" that the crowd responded most strongly - to call Herring's performance or the crowd's interaction catharsis is to put it lightly. A sweaty, reverent Horseshoe audience was clearly impressed - not bad for a band whose last Toronto headlining show was at the tiny Double Double Land only two years ago. 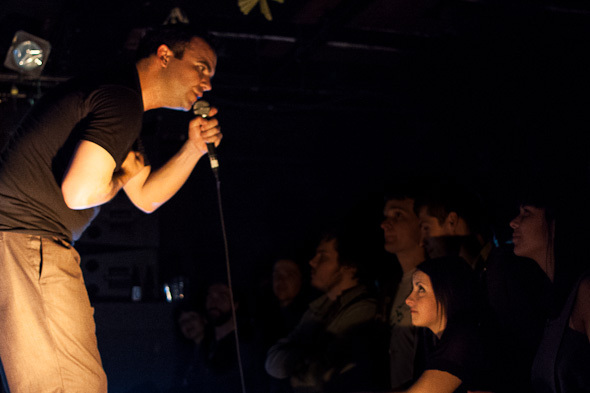 Get onboard with Future Islands as it's clear it's only up from here.